^ 2.0 2.1 2.2 2.3 2.4 2010 Census Gazetteer Files: New Jersey County Subdivisions, United States Census Bureau. Accessed May 21, 2015. ^ Department of Administration, City of Hoboken. Accessed June 22, 2012. ^ City Clerk, City of Hoboken. Accessed July 1, 2012. ^ USGS GNIS: City of Hoboken, Geographic Names Information System. Accessed March 5, 2013. ^ DP-1: Profile of General Population and Housing Characteristics: 2010 for Hoboken city, Hudson County, New Jersey, United States Census Bureau. Accessed February 1, 2012. ^ Table DP-1. Profile of General Demographic Characteristics: 2010 for Hoboken city 页面存档备份，存于互联网档案馆, New Jersey Department of Labor and Workforce Development. Accessed February 1, 2012. ^ 11.0 11.1 GCT-PH1 Population, Housing Units, Area, and Density: 2010 - State -- County Subdivision from the 2010 Census Summary File 1 for New Jersey, United States Census Bureau. Accessed July 31, 2013. ^ Look Up a ZIP Code, United States Postal Service. Accessed November 27, 2011. 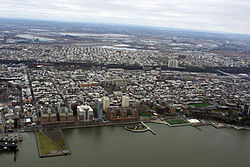 ^ Area Code Lookup - NPA NXX for Hoboken, NJ, Area-Codes.com. Accessed December 30, 2014. ^ A Cure for the Common Codes: New Jersey[永久失效連結], Missouri Census Data Center. Accessed July 1, 2012.